While many seniors support a healthy lifestyle to maintain physical strength, mental wellness and overall wellbeing, vision health should not be overlooked. As vision and eye structure both undergo common age-related changes, it’s helpful to know what’s normal and what isn’t. Presbyopia, which is a typical loss of focusing ability, can be corrected with glasses, contacts, or as the condition advances, corrective surgery. Dry eyes, reduced pupil size, loss of peripheral vision, decreased color vision and vitreous detachment, or floaters, may commonly occur. Serious age-related disease processes, such as glaucoma, macular degeneration and diabetic retinopathy, have the potential to affect quality of life. Though considered an age related eye disease, cataract formation is quite common. Cataracts may begin to form during one’s 40s and 50s. However, most do not affect vision before the age of 60. Initially, early symptoms of cataracts may be improved with glasses or magnifying lenses. When cataract vision loss begins to interfere with daily life, surgery to replace the affected lens with an artificial one is the only effective treatment. 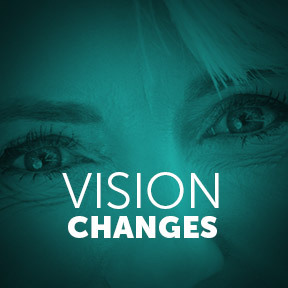 In most cases, cataracts will continue to worsen over time resulting in continual vision reduction. Left untreated for long periods of time, cataracts may cause complete vision loss. Fortunately, modern cataract surgery is considered extremely safe and highly effective. To support long term eye health begin with a well-balanced largely plant-based diet. Include green leafy vegetables, oily fish, citrus fruits and non-meat protein sources. The Mediterranean style diet provides nutrients for eye health and reduced risk of cataracts and macular degeneration, such as omega-3 essential fatty acids, lutein, zinc and vitamins E and C. Exercise, along with a healthy diet, supports proper weight maintenance, thereby reducing the risk of obesity and type 2 diabetes. Poorly controlled blood sugar is a risk factor for diabetic retinopathy, which can damage retinal blood vessels, resulting in symptoms of blurred vision, increased floaters, poor night vision and vision loss. It is highly recommended that adults have their vision checked and eye health evaluated annually, and more frequently if a problem has been identified. Additionally, be on the lookout for symptoms such as loss of peripheral vision, a key sign of glaucoma; difficultly adjusting to the dark when entering dimly lit areas, often the first sign of macular degeneration; distorted vision, as with macular degeneration, straight lines may look wavy; and poor night vision often accompanied by sensitivity to glare, which may indicate the beginning of cataract formation. Dry eyes can occur when the tear production decreases resulting in a lack of sufficient lubrication and moisture on the surface of the eyes. This can arise from a medical condition, as in diabetes, rheumatoid arthritis, lupus or a thyroid disorder; aging and hormonal changes; vitamin A deficiency; or any of the following: contact lens use, smoking and certain prescription medications. Dry eye syndrome associated with aging is relatively common. Symptoms can include burning sensation, inflammation, irritation, eye fatigue, pain and excessive tearing. Symptom relief for those with chronic dry eye can include OTC artificial tear drops, prescription anti-inflammatory eye drops or the use of nutritional supplements, such as BioTears®. Wear sunglasses that block both UVA and UVB radiation. Reduced UV exposure may help prevent cataracts and macular degeneration. Participate in regular physical activity, such as brisk walking, at least 5 days each week. A long-term study involving 15,000 people found that physically active people experienced less vision loss over 20 years than non-exercisers. Don’t smoke, as smoking damages the optic nerve, and increases risk of cataracts and macular degeneration. Take a break from the computer screen. Follow the 20-20-20 rule by resting your eyes every 20 minutes and focusing 20 feet away for 20 seconds. Eat a healthy diet rich in antioxidant fruits and vegetables that contain eye health supportive carotenoids like lutein and zeaxanthin. Include healthy fats and oils for an omega-3 boost. Maintain healthy blood sugar, as well as healthy blood pressure. Clinically supported nutritional supplements for eye health include fish oil, vitamins A, C and E, antioxidants such as lutein, zeaxanthin and astaxanthin, as well as a high quality multivitamin and mineral formula. BioTears® by BioSyntrx: This highly rated very popular dry eye nutritional supplement systemically addresses the structure/function causes and effects of ocular surface moisture production. Biochemically balanced nutrient co-factors support normal production of eye lubricants, as well as mucous membranes, joints and synovial membranes. Ingredients include specific vitamins, minerals and omega-3 essential fatty acids. Lutein/Zeaxanthin by Pure Encapsulations®: These unique carotenoids specifically support the macula and overall visual function, as well as retinal and optical lens health. Gluten free, hypoallergenic, Non-GMO, vegetarian formulation. Macular Support by Pure Encapsulations®: This comprehensive formula provides a powerful blend of antioxidants and botanicals designed to defend and support the macula, which is highly susceptible to free radical damage. Selected ingredients include lutein, zeaxanthin, amino acids and proanthocyanidins that provide exceptional free radical protection in retinal tissues. Gluten and soy free, hypoallergenic, Non-GMO vegetarian formulation. Vital Eyes™ Complete by Metabolic Maintenance: This broad spectrum research-based ocular- protective multivitamin/mineral/antioxidant formula provides powerful antioxidants and nutrients important for eye and overall metabolic health. Gluten, dairy, nut, egg and preservative free. Vision Protect™ by LuxVite™ Naturals: This physician formulated nutritional supplement provides ingredients clinically shown in the AREDS2 study to support the macula and promote eye health. Ingredients include antioxidant vitamins, minerals, and carotenoids. Gluten free, vegetarian formulation. Cineraria Eye Drops for Cataract by Natural Ophthalmics: This homeopathic formula provides ingredients successfully utilized for over a century for cataract care. Broad spectrum professional strength drops may improve symptoms of dry eyes, reduced visual acuity, dim colors and bothersome glare. Preservative free.